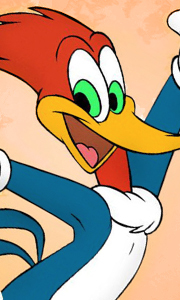 Relive of all the hilarious, crazy adventures of Woody Woodpecker, everyone's favourite wacky red-headed bird, in The Woody Woodpecker and Friends Classic Cartoon Collection! Created by renowned cartoonist Walter Lantz, these original theatrical cartoons - all digitally remastered and completely uncut - showcase some of the wildest antics in animation history. Join Woody and his friends Chilly Willy, Andy Panda, Wally Walrus and Buzz Bu..
Relive all of the hilarious, crazy adventures of Woody Woodpecker, everyone's favorite wacky red-headed bird, in The Woody Woodpecker and Friends Classic Cartoon Collection! Created by renowned cartoonist Walter Lantz, these original theatrical cartoons - all digitally remastered and completely uncut - showcase some of the wildest antics in animation history. Join Woody and his friends Chilly Willy, Andy Panda, Wally Walrus and Buzz Buz..
Own Woody Woodpecker Blu-Ray from Deff, DVD, Blu-Ray & 4K Video Specialists - Free UK Delivery..
Own Woody Woodpecker DVD from Deff, DVD, Blu-Ray & 4K Video Specialists - Free UK Delivery..